If you have 'Sleeping Beauty Turquoise Earrings' in your shopping cart go to View Cart at the top of the page to check out. If you are having any problems with the checkout process we are here to help. Call us toll free 1-877-892-0297 to place your order. Stunning Earrings featuring Genuine Sleeping Beauty Turquoise set in Sterling Silver. Beautiful Post Earrings with Petit Point Design. The Sleeping Beauty Turquoise mine is located in Gila County, Arizona. The mine is now closed and the stones are obtained from private stashes. Created by Zuni Artist Bryant Pablito. Signed by the artist. The Zuni Pueblo is located in New Mexico, Land of Enchantment. 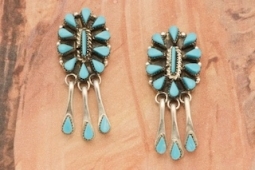 Earrings are 1 1/4" L x 1/2" W.
Treasures of the Southwest is the best! When I first purchased these gorgeous earrings they found a small problem. My money was refunded immediately. The earrings were sent back to the designer, repaired and I was contacted they were ready to purchase again. I said YES! I love this site. Beautiful jewelry and fantastic customer service. The earrings made by Eleanor Largo are beautiful. This is the first time I ordered from you. I wore them the next day after I received them. I felt special wearing them. I am happy with my purchase and purchasing experience. I was just looking for some new turquoise earrings. Stunning color and workmanship. Another beautiful piece from your artists. I am just thrilled with this beautiful bracelet. Past purchases have been wonderful as well. Can’t recommend highly enough!